Originally made this guide on Kronos, figured I'd post it here as well. DISCLAIMER: I'm not saying this is the best/fastest way to level, it's just the way I leveled, and I found it pretty easy and effective. 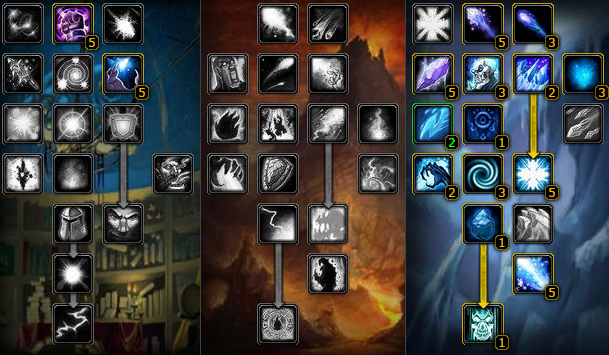 When it comes to Mage leveling, you've got two options: Fire, or Frost. Arcane is just stupid because it has lower DPS, and lots of mobs in the game have high arcane resist, whereas not many have fire or frost resist. Frost has a sweet 6% spell hit talent, talents that increase your crit damage and crit chance against frozen targets, increases to slowing effects, as well as the ever-useful Ice Block and Ice Barrier. While some will tell you to go Fire for more damage, I personally find Frost to be the much better choice for leveling. Especially on a PvP realm where you're constantly under the threat of enemy players attacking you. Frostbolt, while having lower base damage than Fireball, also has a much lower mana cost, which is further lowered by the Frost Channeling talent. So you'll find yourself drinking less often. You also have the added defense of slows/snares, as well as Ice Barrier which is an insane boost to your overall survivability. Fire has nothing really, except the baseline Mana Shield and Frost Nova. While it does have higher DPS, it also has much more downtime and much less survivability. Better suited for group play. Also, in my experience, "Frozen Wrath" greens seem to be cheaper than "Fiery Wrath" greens, at least, at lower levels. Most of them were going for 1g or less, compared to Fiery Wrath greens that would go upwards of 5g. By level 30, I was able to get about +60 frost damage, and by 45, I was rocking +130 frost damage. Really nice to be critting mobs for 30-40% of their health. -Frostbite because it's really awesome. 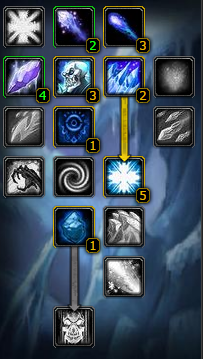 Note that it procs off of your Chill effects, meaning that any kind of Frost debuff that slows the target, can proc Frostbite. This includes Frostbolt, Cone of Cold, Improved Blizzard, Frost/Ice armor, etc. Even if the target is already affected by a slow, when it re-applies, it can proc Frostbite. So every time an enemy melees you with Ice Armor active, and every time you hit with Frostbolt, there's a chance to proc Frostbite. -I personally get Cold Snap because it's a great emergency tool. Resets cooldowns on Frost Nova, Ice Block and Ice Barrier. -Ice Block, yay! This can be used to remove debuffs, as well as get you out of CC effects. It's pretty much exactly like a Paladin bubble, except you can't move or do anything. -Continue into the Arcane tree from here to grab Arcane Concentration. -Note that Arcane Concentration does NOT proc on every tick of Blizzard, like it does on some other servers. Keep that in mind if you are going to be AoE farming. -Last two points in Piercing Ice. This is the build I use to level mages with, however I'm fairly certain it's not the best spec for endgame PvE DPS, or PvP. So you'll want to respec at 60 depending on what you want to do. From 1-10, you pretty much just spam Frostbolt or Fireball. Straightforward. Once you get Frost Nova, you'll obviously want to use that, run 20-30yd away and then keep spamming Frostbolt. 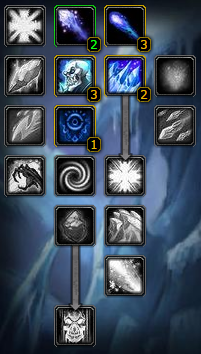 Once you get Frostbite at level 15 though, what you'll want to do is hit 2-3 Frostbolts and then when the mob gets close to you, let it hit you once, to see if Frostbite will proc off of Ice Armor. If it doesn't proc, use Frost Nova as usual. Once you get Ice Barrier at 40, you can cast a 4th Frostbolt (which would usually be pushed back as the mob would be attacking you at that point) before Frostbite/Frost Nova. In general, you should be keeping Ice Barrier up at all times, as it's just a massive, massive increase to your overall survivability. It absorbs all damage (compared to Mana Shield only absorbing physical), prevents spell pushback, and has a much cheaper mana cost than Mana Shield as well. That's about it, really. Once you get Shatter and Ice Shards, you'll be dishing out big crits for 25-35% of an equal level mob's health, while keeping them away with Frostbite and Frost Nova. SP is your best stat overall, so "Of Frozen Wrath" greens will be very useful, as well as the "Azure" tailoring set. Int is okay, though stacking it does not provide much benefit, as the extra time casting will also come with extra time drinking. Stam is also very nice, seeing as Mage has the lowest base health of any class. 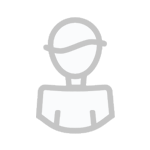 Around levels 10-20, you will definitely want to get lots of stam gear, because your health is just pitifully low and you don't have many survival tools yet. Spirit is relatively useless, as you have no 5-second-rule regen unless you're using Mage Armor, which you should only be doing in dungeons/raids. (and even then it's only 30% of your regen) Spirit's only other use is boosting your Evocation amount, but really, even with 0 spirit on your gear, Evocation still restores at least 70% of your mana, so you really don't need to go out of your way to get spirit. Rolling need on spirit gear will only piss off Priests who actually make good use of Spirit. Don't completely ignore Int, though. It's okay to sacrifice a few spell damage for a big gain of Int, such as going from a gear piece with 11 damage, to a piece with 7 int and 8 damage. You won't really notice a difference in damage, but that extra mana will be noticeable. -Azure crafted set: Chest+Pants+Gloves+Cloak+Shoulders, will give you a total of +50 Frost damage, and the materials will only cost you maybe 4 or 5 gold total. The chest+pants are trainer-taught, but the gloves+cloak+shoulders are from random world drop recipes, so it might be harder to find a tailor that can make them. -Star Belt: +4 spirit, +13 spell damage, seems to be a very rare world drop pattern though, so good luck finding a tailor that can make it. I bought the belt itself for 4 gold on the AH.  -Inquisitor's Shawl: +8 int, +9 spell damage, Nice shoulder from SM Cath, will probably last you to at least 50-55 or so. -Icefury Wand: +9 frost damage wand from the Mage-only quest chain, beginning with "Journey To The Marsh". Can be picked up at level 30. The part involving SM: Lib can be solo'd at level 44. -Zum'Rah's Vexing Cane: +10 int, +10 stam, +21 spell damage, Perfectly itemized for Mage leveling. There are lots of groups running Zul'Farrak, so this should be really easy to get. -Southsea Mojo Boots: +11 int, +8 spell damage, really easy to obtain from a single quest, "Southsea Shakedown". If there's any others, let me know. Yes, Frost is the only spec in the game that can (quickly and efficiently) AoE grind to level, but in my experiences, it can be a bit frustrating for a couple of reasons. And thus, the only time I would ever get to AoE grind, is if I just happened to get there when nobody else was there. Which didn't happen very often. If you are going to AoE grind, the biggest thing of note is that you *CANNOT* have Frostbite. It will randomly freeze mobs and the group will be broken up, with half of them frozen and half of them walking towards you, and it's just impossible to keep them all at range. Also, you'll want to just stack Int/Stam gear. Spell Damage gear is BAD for AoE grinding, because Blizzard does not scale very well with spell damage. (IIRC Blizzard only gets ~11% contribution from spell damage) You'll just want to stack int to have a big mana pool, and stack stam so that you won't get wrecked when you're running around gathering up mobs. Also, Blizzard *CANNOT* crit, so talents like Shatter and Ice Shards are useless for AoE farming. But I'd still take them anyway, because there's really not much else you can put your points in. Really the only difference between the "AoE farm" spec and the specs I have posted above, is putting points into Imp Blizzard, instead of Frostbite. That's all there is to it, I suppose. PS. I play on pve, so I dont need cold snap so much, especially in leveling Some may argue that it would be better than 1 talent on arctic reach... but arctic reach is something I benefit in every mob, every fight..
Good luck with that with crowded server. You can't AoE farm with Frostbite. It will keep randomly freezing mobs and breaking up the group. Thinking about buying a 60% mount i guess it doesn't make sense to buy all spells up to lvl 40.. which do i have to buy and which ones can I leave out? All fire spells? Hi. I am mostly gonna level through dungeons with 4 friends and rarly play alone. I am looking for a frost spec that is strong in 5 man and in solo pvp. But has worse mana efficiency. Yes, you'll kill things a little faster, but your DPS is much more reliant on random crits, and you'll be drinking every 2-3 mobs. The specs I posted in the guide can be used for 5man and solo PvP just fine. 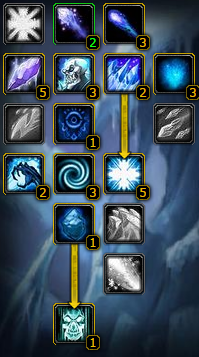 You can't really go wrong with a frost mage. Once you get the hang of it and manage to get packs of mobs on the same respawn timer, you can aoe farm even on crowded servers. You'll know when packs will respawn and can round them as they are spawning or right after they have spawned. I'm personally leveling my mage with 90% AoE farming on Anathema PvP. Of course, you'll get ganked occasionally, but to me it's still worth it.